Bring 4 cups of water to a boil in a medium-size saucepan. Add the couscous and reduce the heat to very low. Cover the pot and simmer for 12 to 15 minutes, until the couscous is just tender. (I pull the pot halfway off the heat.) Drain in a colander. Meanwhile, combine the salmon, lemon zest, lemon juice, olive oil, capers, olives, red peppers, garlic, 1 tablespoon salt, and 1 1/2 teaspoons black pepper in a large bowl. 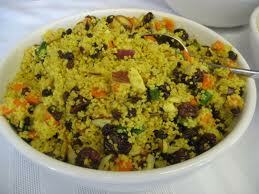 Pour the hot couscous into the mixture and stir well. Cover and set aside for 10 to 15 minutes, stirring occasionally. Just before serving, stir in the scallions, basil, juice of the 1/2 lime, and 1 more teaspoon of salt. Taste for seasonings and serve warm or at room temperature. I like to garnish this with wedges if lime, so you might as well serve this with tequila coolers! This entry was posted in Salad and tagged black olives, cooking, couscous, food, lemon zest, long island, picnic, picnic season, Salad, salmon, seafood, tablespoon salt by chefbill. Bookmark the permalink.